Donald A. Norman wrote a couple of pages in POET about keyboards and how hard usability experts try to make them as unusable as possible – e.g. by arranging the keys in alphabetical order. Another issue struck me a couple of days ago when I was helping a friend log in to his computer. The machine wasn’t accepting passwords. My first guess was “maybe the caps lock key is pressed?” and my friend asked “how can see that?”. This reveals a popular breach of a fundamental usability principle: always visualize the state of a thing – and do it as close to the context as possible. On the following photos one can see that with some keyboards this isn’t the case. 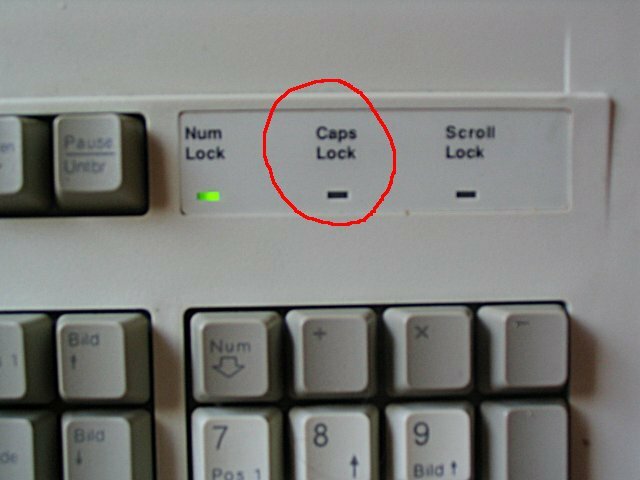 And in fact I know only keyboards that work like the one shown below: the state of three stateful keys is visualized with three LEDs in a place at the upper right corner of the keyboard. For the caps lock key this means that the visualization couldn’t be placed farer away from the key. Like this isn’t bad enough some designers even decide to label the LEDs differently from the keys they represent. 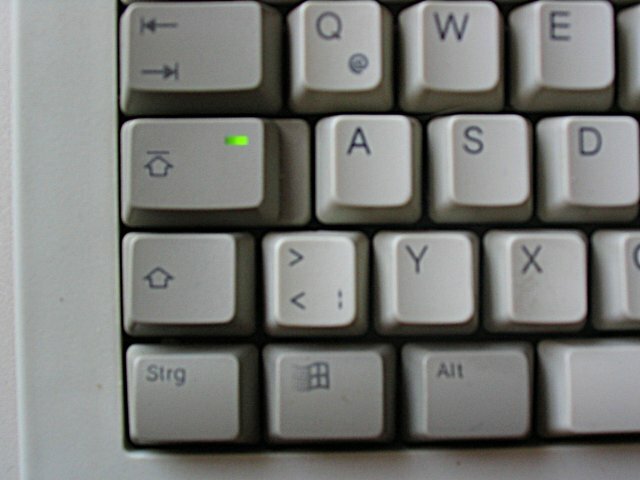 In the example given the caps lock key itself is labled with an arror symbol (that – on a side note – can only be understood by people who know how mechanical typewriters work) but the corresponding LED is labled “Caps Lock”. The only reason for placing the state visualization as far away from the corresponding keys is that every keyboard works like this and users are already familiar with this design. Then, again, the sensible solution, namely to put an LED in each stateful key, wouldn’t require users to learn much because this design is natural. Additionally, the advantage for vendors would be more space for even bigger logos. I hope this somehow convinces some vendors to try this new design. The fourth image shows a mock-up of this idea. Update: Keywan wrote that Apple has been manufacturing their caps lock keys this way for quite a while what I, being a PC follower, didn’t know. Anyway this makes it even stranger that this idea is so rarely implemented. This entry was posted on Thursday, April 28th, 2005 at 10.57 am	and is filed under Usability. You can follow any responses to this entry through the RSS 2.0 feed. Both comments and pings are currently closed.